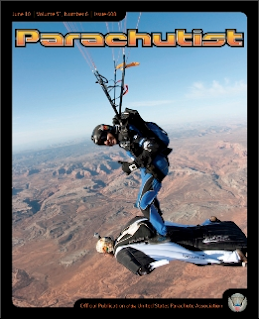 An awesome photo from Project XRW makes it onto the cover of Parachutist Magazine's June Issue. At Skydive Moab in Utah, Jonathan Tagle lands his canopy on wingsuiter Jeff Nebelkopf’s back as part of the Project XRW jumps held during the Operation Freefall event that raised funds for sexual assault prevention and healing programs. The full story appears on page 50. Video of the jump here.For more information on June's Parachutist, click here.